Goa Chief Minister Manohar Parrikar, who was in the United States for treatment for a pancreatic ailment since March, has returned to his home in Goa. He landed in Mumbai this afternoon, and then took a flight back to Goa. 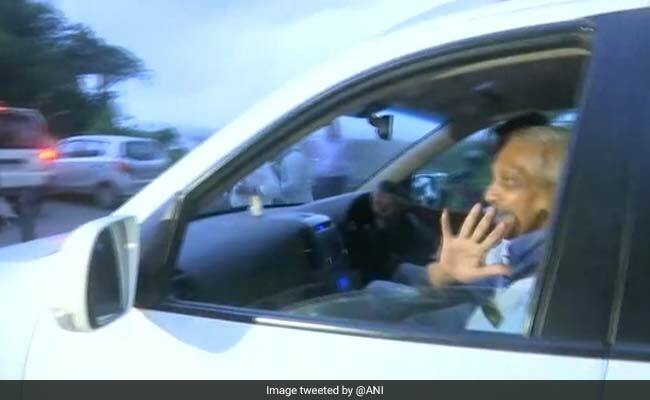 Manohar Parrikar landed at the Goa airport around 5.45 pm and was received by state Health Minister Vishwajit Rane. He went to his residence in Dona Paula close to Panaji. "It feels nice to be back", news agency ANI quoted Mr Parrikar as saying. Manohar Parrikar, 62, was being treated at a hospital in New York for the last three months. The former Defence Minister has been hospitalised on three occasions in Mumbai's Lilavati Hospital and the Goa Medical College since mid-February. He was shifted to the US in March first week this year for specialised treatment. A visibly-thin Parrikar, who walked out of the terminal building at the Dabolim International Airport wearing a blue shirt, was welcomed by Health Minister Vishwajit Rane and Director General of Police Muktesh Chander, among other Goa government officials and state BJP office bearers. Before leaving Goa, Manohar Parrikar had formed a cabinet advisory committee to guide the state administration on governance and other issues, in his absence. The committee comprises of Sudin Dhavalikar (of the Maharashtrawadi Gomantak Party), Francis D'Souza (of the BJP) and Vijai Sardesai (of the Goa Forward Party). The MGP and the Goa Forward Party are allies of the ruling BJP in the coastal state. Sources close to Manohar Parrikar said that a cabinet meeting, scheduled for tomorrow, has been cancelled. "Nothing has been decided about his schedule for tomorrow. We will inform the media once it is ready," a senior official said.